Dr. Andrew Lees is the anti-Benway but he learned quite a bit from the practices of the old croaker. And from William Burroughs too. 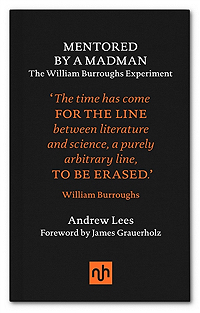 In Mentored by a Madman: The William S. Burroughs Experiment, Dr. Lees merges travelogue, medical mystery and memoir to depict his coming of age as a neurologist as well as his personal explorations following in the footsteps of Burroughs as both scientist and writer. Burroughs’ work is a cornerstone of Dr. Lees’ library and, as he persuasively argues, others in the medical profession should find room for Burroughs on their shelves as well. Doubtless Dr. Lees’ account would have pleased Burroughs to no end and would have found a central place in his library too. I cannot recommend this book strongly enough. Entertaining and enlightening, Dr. Lees succeeds in not just telling a great personal story but in providing new insights into Burroughs, extending the already vast and seemingly endless range of influence and importance of el hombre invisible. Along with Jim Pennington, Lees demonstrates that those outside the Burroughs Establishment have much to offer the Burroughs Community and general readers at large. I would suggest purchasing the book from Notting Hill Editions directly. That press is doing very exciting work in injecting some green and ready into the essay form. Besides being well written, the book as a physical object is also proof that the ebook leaves much to be desired. Dr. Lees was kind enough to answer a few questions, which I hope will inspire you to add his memoir to your book collections. I want to start off by saying how much I enjoyed your memoir. And by that I also mean as a physical object. I thought it was beautifully produced and well printed. It reminded me of a pocket medical handbook. Was that intentional? Notting Hill Editions is a relatively new UK publishing house, which has set out to reinvigorate non-fiction essay writing in the English Language. All their books have the same broad design although I chose the black colour and the quote for the front cover. They have taken their cue from the vivid contribution of the short text to continental European culture. When my copy of Mentored by a Madman: The William Burroughs Experiment arrived I got high just admiring the cover, the foil blocking, the spot-colour dropped caps and folios. Touching the cloth, the case and the paper then created a state of ecstasy . Your memoir is filled with references to scholarly journals, books by botanists and explorers as well as, of course, the work of William Burroughs. What and who were your models and influences in writing the memoir? My first influence was Richard Spruce, a Victorian botanist who discovered the principal plant ingredient of yagé. Richard Evans Schultes — Doc Schindler in the Yage Letters — was also inspired by Spruce and switched from medicine to botany at Harvard. I took the safe option and made a career of neurology but maintained my interest in natural history and often after a busy clinic yearned to escape to the freedom of the rainforest. There is an uncanny inverse symmetry in my book, which I did not appreciate until it was finished. After leaving Harvard, Burroughs dropped out to become a psychonaut exploring inner space. When he was later asked what he would have done if he had not become a writer, he sometimes replied that he would have liked to have been a physician. Only at the age of 65 did I have the courage to try psychedelic plant medicines. Burroughs liked to imagine himself as a sort of voodoo healer but restricting his ministrations to his friends. I was interested to see that you interned at Salpêtrière in France, the legendary birthplace of neurology where Jean-Martin Charcot worked. As I understand it Charcot was one of the first scientists to incorporate photography — specifically serial photography, an early form of film — into his practice. At its beginnings, neuroscience was able to make use of a new and revolutionary medium. But what the hell happened? 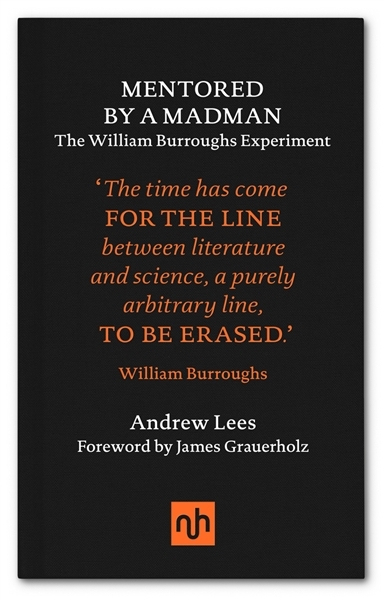 Why the conservatism now, such that a writer like Burroughs would be considered a madman? Charcot is rightly acknowledged as the Father of Neurology. He perfected the systematic anatomo-clinical method which still underpins the clinical gaze. As part of his own self-exploration, he experimented with hashish as a medical student. In accusing Timothy Leary of being unscientific, Burroughs was inadvertently exposing the essential difference between neurology and psychological medicine. Neurology is a visual art and many of its fully established syndromes offer the possibility of spot diagnosis in the street without the need for the doctor’s bag. Charcot was one of the first physicians to realise the potential of photography in medicine and set up the world’s first department of medical illustration under the directorship of Albert Londe. Rather than simply observe and document, Londe often used the flash of his camera to startle Charcot’s patients into an unselfconscious performance of the symptom. In this way, the camera functioned not simply as a recording device, but also as a prod. Daguerreotypes of many of the cases on which Charcot taught in his Leçons du Mardi were published in La Nouvelle Iconographie de la Salpêtrière. Charcot was also a talented artist illustrating his case histories and textbooks with his own sketches. His residents were expected to scrutinize the paintings of the Grand Masters in the hope of identifying examples of the syndromes he was describing in his clinic. Speaking of Salpêtrière, why were you influenced by Burroughs instead of, say, Michel Foucault? Much of Foucault’s thought was born out of Salpêtrière and he died there. I read Naked Lunch in 1967 as a medical student. I struck a Faustian bargain with Burroughs that allowed me to complete my medical studies and later search for cures for the shaking palsy. Burroughs in turn demanded I listen to what he had to say about doctoring and research. I did not read Foucault until quite recently but while agreeing with his notions that power and knowledge are used as a form of social control I found much of his writing opaque. It was if he was trying to blind me with philosophy. Burroughs was more accessible and got there first. I greatly enjoyed your account of first coming into contact with Burroughs. A book could be published on these origin stories since first reading Burroughs is like a coming of age story or major turning point for so many people. Do you mind sharing yours? 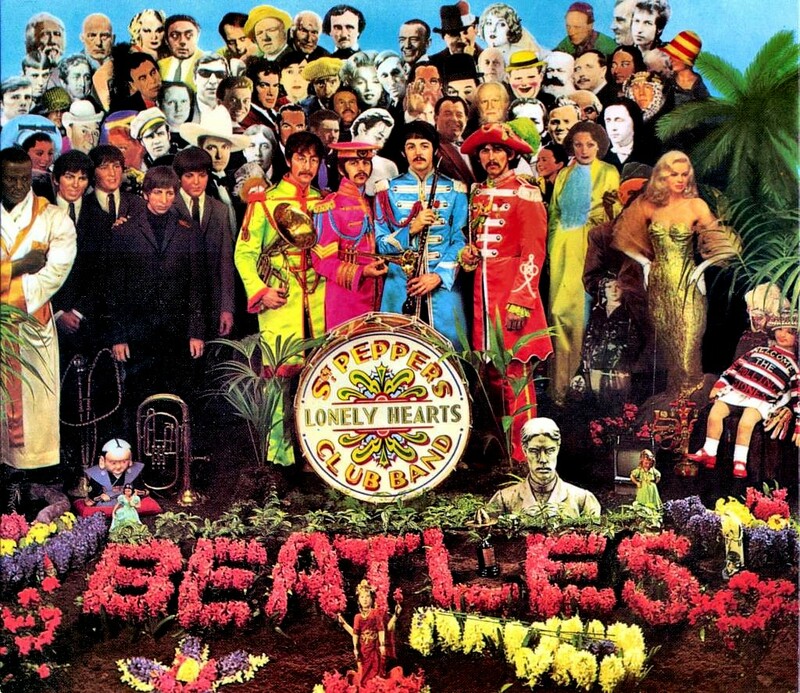 Burroughs was one of the people identified on the Sergeant Pepper’s Lonely Hearts Club album front cover that I’d never heard of, so I looked him up. At the height of the first Summer of Love, a medical student friend recommended I read Naked Lunch. The description of Benway’s behaviour reminded me of one of the surgeons at the London Hospital where I was training to be a doctor. Burroughs’ lurid urinal descriptions were also a helpful introduction to urology. I am fascinated by the period of Swinging London in which you first experienced Burroughs and in which you first studied medicine. You describe your double life in the memoir. Can you go into some detail about what it was like at the time? I think the zeitgeist at that time was “Nothing is true, everything is possible!” There was a feeling that a cultural revolution was needed and a determination that Europe must never go to war again. We believed that all the brutal neurodegenerations would be vanquished through scientific endeavour. Looking back the best thing that came out of the sixties was not psychedelic drugs or L-DOPA but the arrival of the oral contraceptive. For the first time people were able to live together without being forced into suffocating marriage. Your memoir is filled with the names of all the scientists and doctors who proved instrumental in teaching you along the way. What have you learned from the good Dr. Benway? I was really happy to see a good portion of your book dealt with apomorphine. 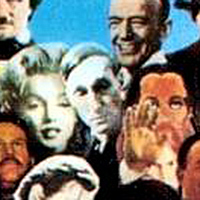 Burroughs felt it was something of a cure-all for society’s ills. What are your hopes for apomorphine? One problem for apomorphine is its name — apo is classical Greek for “like.” Although apomorphine is synthesised from morphine by heating it with hydrochloric acid, its pharmacological effects are very different. Without the slightest justification it continued to be classified as a schedule II controlled substance in the State of California until 2010. This meant that it was considered to have an accepted medical value ( like morphine) and was also considered to present a high potential for abuse, that could potentially lead to severe psychological or physical dependence. The evidence for this designation was non-existent. This may partly explain why Burroughs championing of the “junk vaccine” in America fell on deaf ears. In 1988 as a result of re-reading Naked Lunch, I had the hunch to resurrect apomorphine as a treatment for nervous disease. Following my research at University College Hospital that included self-experimentation, apomorphine eventually returned to the pharmacopoeia and is now widely used for the management of advanced cases of Parkinson’s disease in many parts of the world. Nevertheless a fear that it might have addictive potential has lingered and hampered its widespread uptake. It is now understood that the chemical messenger dopamine is a key player in the neurobiology of substance dependence and that alcoholics and cocaine addicts have a reduced responsiveness to physiological dopamine release. 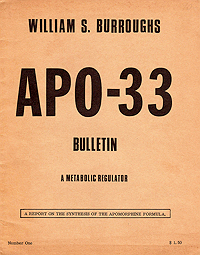 Burroughs had hoped that a powerful orally active derivative of apomorphine with fewer adverse reactions would soon become available but this has not come to pass. Several years ago I wrote an essay on Naked Lunch and apomorphine. I felt that apomorphine was only thought to influence Naked Lunch by helping him kick junk. Yet apomorphine has a whole history of use as well as side effects that I think alsp influenced Naked Lunch. What are your thoughts? 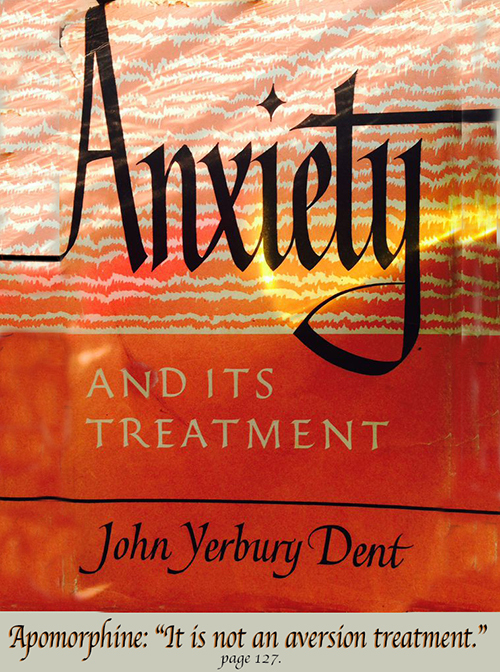 Doctor John Dent, Burroughs’ doctor in London, eventually came to the correct conclusion that apomorphine’s value in the management of alcoholism and narcotic addiction was not due to its aversive emetic effects but stemmed from a metabolic action on the back brain, which corrected the chemical dysregulation that induced craving and drug wanting. In 1967, a few years after Dent’s death, apomorphine was shown to be a powerful stimulant of dopamine receptors. Dent insisted that apomorphine had to be given continuously round the clock for 5-6 days to be successful and that morphine or alcohol should be tailed off in the first three days of in-patient detoxification. Single injections of apomorphine were useless. Dent also acknowledged that his 66% remission rate depended not just on the pharmacological properties of apomorphine but a holistic approach that required encouragement and emotional support. 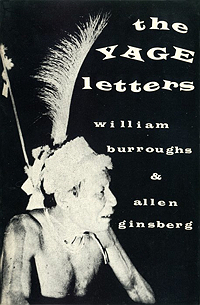 He encouraged Burroughs to write to cure his anxiety and hang-ups without the need for drugs. When we carried out our clinical pharmacological studies in the 1980s that resulted in apomorphine gaining a licence for the treatment of Parkinson’s disease we realised that the mode of administration — continuous delivery by a pump as opposed to intermittent “shots” — greatly influenced the behavioural response of the patients. We found that continuous delivery was much more efficacious in smoothing out fluctuations in mood and motor performance (on-off effects). Interestingly we also observed in some Parkinsonian artists and writers renewed bursts of creativity, which made me wonder whether Burroughs’ statement that he would never have been able to put Naked Lunch together without his treatment in London with apomorphine had some scientific substance. It thrilled me to see that your colleagues gifted you a copy of the Beach Books APO-33. In your memoir you talk about how Burroughs used the underground press of the Mimeo Revolution to stand up to not just mainstream corporate publishing but the pharmaceutical industry. You also express your disenchantment with the medical publishing apparatus and how it stifles creativity and dissent. What can the academic and medical community learn from the publishing practices of the Mimeo Revolution? Medical publishing has become a massive business with electronic “predator” journals sprouting up every month. Many of these journals require the author to pay for the pleasure of having their articles published and to sign a form saying the copyright is handed over to the publisher. The peer review system is almost broken in medical science. Anonymity allows saboteurs to destroy unfairly competitors’ discoveries and copy the results. Ghost writing is used by many pharmaceutical companies and even some high-impact journals are susceptible to their influence in deciding whether a paper should be published. The open access movement in medical science and the use of Twitter and medical blogs may be a sort of “little mags” reaction to what is happening but as long as academic promotion depends on impact factors and H-indexes mainstream medical publishing by corporations, like Elsevier and Wiley, will rule. The Yagé Letters is a central text for you. It has led you on a journey of medical and personal exploration. Let me play devil’s advocate here for a minute. What are your thoughts on the negative influence of Burroughs’ Yagé Letters in terms of drug tourism and the exploration for pleasure and profit of exotic locales like the Amazon? Burroughs was keen to try to collaborate with scientists whenever the opportunity arose (Schultes; Evans, the inorganic chemist in London; Grey Walter, the neurophysiologist in Bristol; and Dent his London doctor) but most of these men were not prepared to treat him as a co-investigator. In the rain forest even if he may have been hoping that yagé would help to straighten him out, his approach to its investigation was that of a freelance scientist. In New York before leaving for Colombia, he researched his subject and was disappointed by the small number of first-hand accounts of its psychopharmacological effects. He was also intrigued to learn that the CIA was investigating the drug as a way of inducing automatic obedience in suspected terrorists and dissidents. On arrival in Bogota he headed for the university to research the “vine of the soul” putting himself in the right place to meet scientists who could help his investigation (in this case Richard Schultes). In 1954 on his return from Peru, Burroughs sent Doctor Schultes a voucher specimen of Psychotria viridis, the nondescript shrub in the coffee plant family which contained dimethyltryptamine (DMT), stating that the hallucinogenic effects of yagé occurred when its leaves were mixed with Banisteriopsis caapi. This was 14 years before the mysteries of yagé were finally announced to the scientific world by Schultes. Burroughs wrote in his letters to Ginsberg that the medicine men varied the ingredients depending on what psychic effects they wanted to produce and that repeated yagé use led to a tolerance to the emetic and purgative effects that carried over for more than six months after abstinence. Burroughs also added descriptions of the plant mixtures’ effects on the mind based on his self-experimentation. The importance of yagé to Burroughs’ literary aesthetic has in my view been underestimated because of his repeated warnings about its danger and the many bad trips he experienced with psychedelic drugs. These particularly unpleasant reactions may have been due in part to the fact that his liver had been compromised by alcohol and narcotics. If anybody is to blame for ayahuasca tourism, I would point the finger much more at Timothy Leary and Richard Alpert than Burroughs. One of my favorite chapters in your memoir was the Bladerunner chapter. Recently the medical industry has intruded itself into my life and Bladerunner: A Movie seems yet another example of Burroughs being right on point and ahead of the curve. 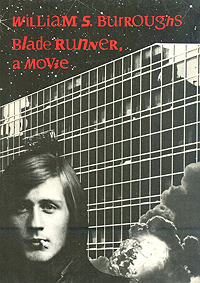 Can you share your thoughts on Bladerunner? 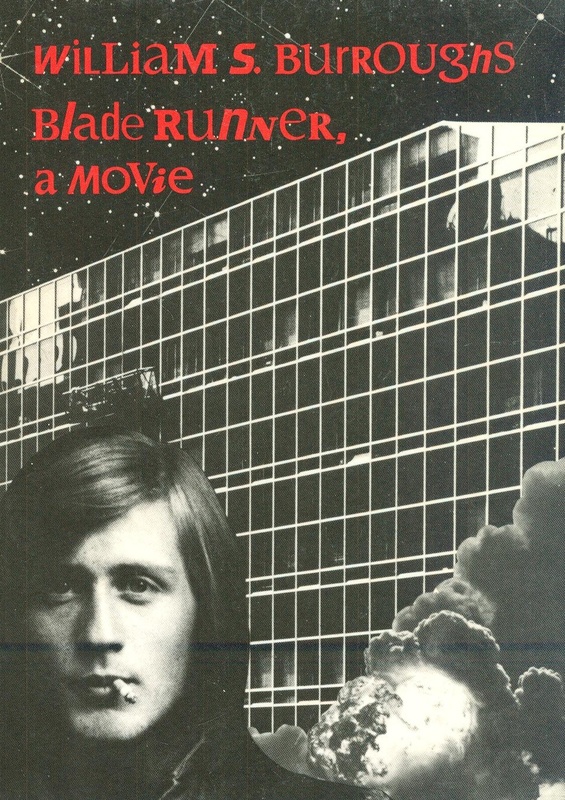 Bladerunner: A Movie, based loosely on physician and sci-fi writer Alan Nourse’s original book and nothing at all to do with the Ridley Scott movie, is one of Burroughs’ most interesting books from the perspective of doctors and was recommended to me by James Grauerholz. In the book Burroughs predicts the demise of totalitarian healthcare systems and anticipates the emergence of AIDS. Within a generation of these reforms, average life expectancy has soared to 125, and is leading to a disturbing rise in the incidence of hereditary disorders, “everybody would be diabetic or diabetes-prone by the late part of the next century.” New plagues of Alzheimer’s and Parkinson’s disease begin to emerge in the aged. A biomathematician predicts that the planet will soon be flooded with the worst samples of humanity with the lowest biological survival value. As a result of these changes by 2014 New York has become a world centre for underground medicine flourishing outside the medical establishment and the Government. I was reminded a lot of Ivan Illich’s condemnations of the healthcare business and the controlling power of doctors when I read it. When I enquired to James about this link he informed me that Burroughs had a heavily marked copy of Medical Nemesis in his possession. I see you are associated with Kings College. I spent a semester abroad there just after Eric Mottram left. Mottram got the ball rolling on Burroughs Studies with The Algebra of Need and he definitely pioneered American Studies in the UK. Have you felt Mottram’s and Burroughs’ influence at Kings? I have spent most of my working life at University College London, which is another separate part of the Federation of colleges making up the University of London. You are referring to a collaboration that we are doing with friends at Kings College London. Medical scientists are the last people to ask about what other people in their universities are doing and thinking. Most live in ivory towers and prefer the company of their scientific colleagues rather than mix with people on campus from arts faculties, which is a pity and partly why I have written this book. I think the “Beats” are of little interest now at British universities although many of Burroughs’ prophecies have come to pass without young people realising his prescience. Resistance to control and authority, which motivated the counterculture, seem no longer important issues, cynicism and acquiescence are new viruses. I was cheered however that on a recent BBC television programme called University Challenge a question relating to William Burroughs was answered correctly by a Cambridge undergraduate. On a personal note, it has become increasingly obvious to me that my attraction to Burroughs comes from an attempt to deal with anxiety. In addition reading and collecting Burroughs seem a means for me to activate the dopamine centers in my brain. Can you speak on the role of anxiety for Burroughs as well as your thoughts as a neuroscientist on collecting as an impulse? Burroughs wrote well with a distinctive style from a young age and he also experienced spontaneous visions. I am sure he was correct when he wrote that narcotics stifled all creative output but his withdrawals after detoxification may have provided epiphanies in which he saw the world much more brightly. It is also possible that apomorphine reset his dopamine receptors and increased his motivation and drive. Although it is conceivable that his claim that apomorphine had cured him (which of course it hadn’t) was a ruse, Burroughs valued integrity in his friends. Dr. Dent seems to be one of the very few doctors he was treated by who gained his respect. 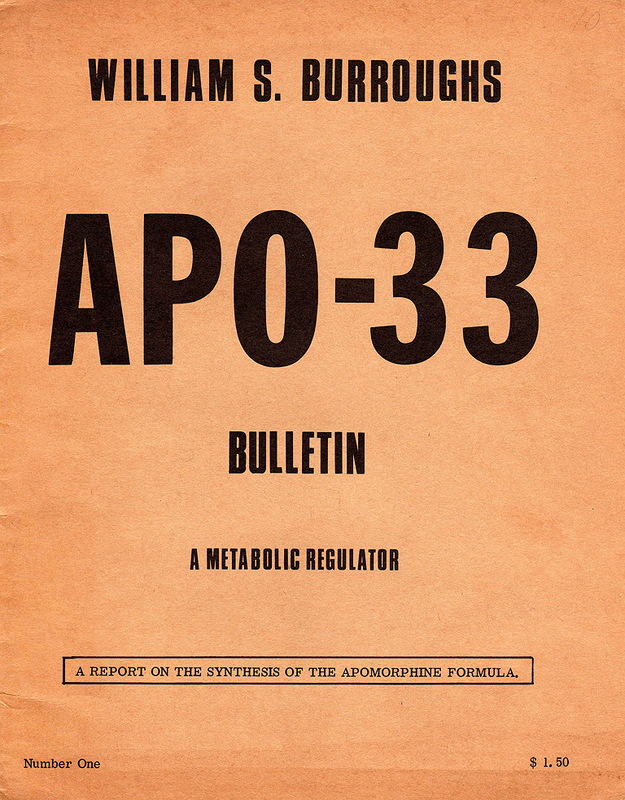 Burroughs considered anxiety as the greatest scourge of twentieth century life and apomorphine’s sedative effects may have also been beneficial to him. It is also possible that his compulsive writing helped to reduce his anxiety levels and was a sort of occupational therapy. 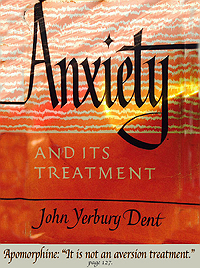 He frequently referred to the book Anxiety and its Treatment in which Dent had written that individuals with severe chronic anxiety were at greater risk for substance dependence than the rest of the population. Where do you think Burroughs is going to lead you next? Burroughs’ yagé epistles introduced me to a different form of rainforest science than Richard Spruce, encouraged me to get away from concrete thinking, float in outer space, and run alongside a beam of light. They reminded me that clinical investigation should not be limited to institutions and that scientists must find new ways to regain the power to explore. Hundreds of curious neophytes, some with depression, substance dependence, or biological addictions, now head for the Colombian and Peruvian jungles every week. Like Aldous Huxley I did not have the courage to take yagé until my autumnal years. My experience in Leticia with yagé allowed me to break down some restrictive boundaries and take more risks in my research. Self-experimentation, although denigrated as subjective and self-serving in many circles, has a noble and productive history in medical science and I will continue to advocate it to my students as well as research the possibilities of Banisteriopsis caapi as a potential therapy for Parkinson’s disease and depression. In collaboration with a medicinal chemist at Harvard called John Neumeyer who was also influenced as a young man by Naked Lunch I have also returned to Burroughs’ hope that new more powerful orally active apomorphine like drugs can be developed and brought into medical practice. I’ve thoroughly enjoyed the book written by Doctor Lees and thoroughly enjoyed Jed’s presentation of the Doctor’s work here @ RS. Yes, an excellent book by Andrew. Healing matters, ;).